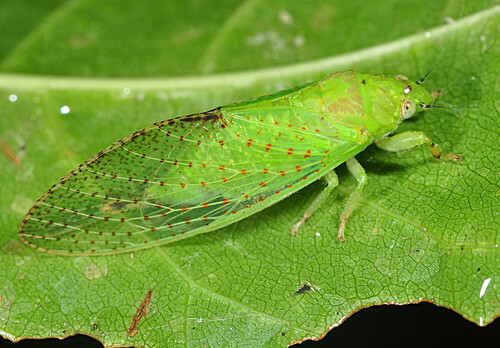 Orange-speckled green cicada (Lembeja sp nov), originally uploaded by artour_a. A pretty green speckled cicada from North Sulawesi, Indonesia. If you can identify the species, let us know. I was recently in Bogor, Java, Indonesia. Every evening at sundown, there is a very loud buzz that sounds like a buzzer at a basketball game. One starts, then is slowly joined by all. They buzz for about 1/2 hr. and then dwindle back down to one and over. What do you suppose it is?